Thank you for visiting Kan Du Shetland Sheepdogs. My name is Kandi Sickles and my husbands name is Scott. We are a small hobby kennel Specializing in AOACs, with Bi color being our first love. 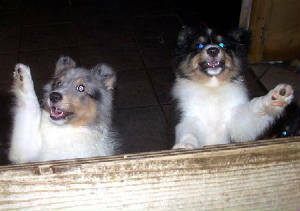 We strive to produce Shetland Sheepdogs of AKC breed standard. Our dogs are health tested and have outstanding temperaments, and we only breed to the same! All companion puppies are sold on a strict Spay/neuter contract (AKC limited registration). We will be adding new pages soon!